Limefield House is a late Georgian house, situated on a hill called Clarence Brow near to Clarence Mill. 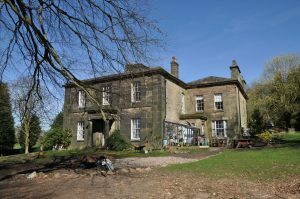 It was built by Martin Swindells I in 1830 for Joseph Brooke originally from Birstall Yorkshire and his first wife Anne Swindells. (Joseph Brooke later became a partner to Martin Swindells I). The house is constructed with Ashlar brown sandstone, with a Tuscan porch. It has a Welsh slate pyramidal roof and a large central stone chimney. In the 1841 census Limefield`s address is off Beeston Brow,possibly the same gates that lead to Rock Bank house, later this entrance was sealed up and access was from Clarence road. 1851: Joseph Brooke still lived here but with his second wife Sarah (Dalton). His first wife Anne died in 1849 aged just forty three possibly in child birth as her youngest child Arthur was born in the same year.There are three children there at this time, two are from his marrage to Sarah, they go on to have three more children. 1861: Joseph Brooke is still here but with no wife. He has three children living with him (the youngest is 9), together with five servants. 1871: Joseph Brooke is still at Limefield with three adult offspring and four servants. Joseph died in 1872. His second wife Sarah did not die untill 1891 but it is not known where she was on the 1861 and 1871 census. 1891: the Alcock family (farmers) now live at Limefield. Possibly named Erick (from Congleton), aged twenty seven, with wife Emily (from Newcastle-under-Lyme ), also aged twenty seven and their three year old son. The mother Mary Ann aged sixty six also lived there, (originally from Rushton). Finally one farm servant. Alfred J. King lived at Limefield in 1892 to at least 1898. By 1901 census he was living at nearby Rock Bank House. However the Kelly`s Directory also has R.B.Martin living at Limefield in 1896. perhaps he had a business at the stables . He is still there in 1906. 1901: Walton Aston lived at Limefield house, he was aged thirty nine years. He was an architect and surveyor and lived there with his wife Katherine and baby daughter (aged 3 weeks). 1906: R.B.Martin lived there. Also farmer Solomon Barber. Leonard Haigh lived at Limefield in 1914. Private LEONARD HAIGH Army Service Corps M2/194141 was born 19 October 1880 at Prestwich, the son of Charles Henry Haigh and Alice Clara (formerly Paley) and was baptised at Prestwich 10 December 1880. He lived at Wilton Terrace, Prestwich in 1881, was at boarding school in Southport in 1891, visiting a family at Burnage Lane, Burnage in 1901, and was a cotton spinner visiting another family at Wood Lane Timperley in 1911. He married Eudora Mason 6 June 1912 at Timperley. He was a former England International Rugby player but developed double pneumonia while undergoing officer training at Woolwich and died 6 August 1916 aged just thirty five. He was buried at Pott Shrigley and is named on the memorials at Bollington and St Oswald’s. 1914 and 1923: Samual Knight lived at Limefield according to Kelly`s directory. In 1939 Stephen Sheldon a cattle dealer and farmer lived at Limefield House. He was forty eight years old. His wife Daisy aged forty five years and their son Kenneth aged 9 years also lived here. There are two more children but the names are blocked on the 1939 census which usually means they are still alive. Later Dr John Coupe and Dr Jean Coupe lived at Limefield, they shared it with Stephen Sheldon. They were followed by John Broadhead although not sure of the year`s for these last entrant`s. 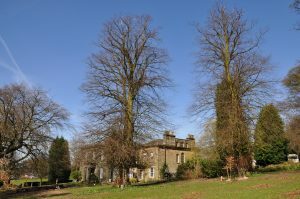 The historical information on this page about the construction of the house is taken from the Images of England website. The above photos were taken by Tim Boddington. Our thanks go to Linda Bester, who has researched census information to present an interesting history of the house’s residents.